I love this feather bed. I have an extremity firm mattress, so it alone isn't enough. I have it on to of a 3 inch memory foam topper and the result is perfect. The downfall is the height of the bed, but standard sheets fit with some tugging. Getting the down layer is essential otherwise you get poked by feathers. Down-top Luxury Feather Bed. Top layer is 230TC Cambric Cotton face filled with 650 Fill Power Hypo Cycle Down. Our multi-step cleansing process delivers a hypoallergenic product that meets all state and U.S Department of Agriculture (USDA) regulations. Baffle box Construction creates maximize loft and comfort, and minimizes cold spots. Bottom is filled with premium feathers for ultimate in loft and comfort. Aahhhhhh.............what I say when I lie down at night on my newly purchased feather/down combination mattress topper. I cannot wait to go to bed at night where previously I would fall asleep on my couch and slept their many a night to avoid my mattress. I have a Craftmatic Bed which I like because of the head/feet adjustments; however, the mattress was too firm. I would wake up during the night with painful shoulders and hips. I had previously owned a feather topper and had gotten many years use from it, but I dropped it off at Goodwill a few years back. I researched feathers vs. down and realized quickly that down would be the preference, but my checking account could not afford a Hungarian White Goose Down mattress topper. So, I purchased the next best topper.......a feather base with a down topper. Love, Love, Love my topper. I look forward to going to bed at night. I sleep all night through. I wake up refreshed........... and pain free. I have even started dreaming again which also lets me know I'm getting into that deep REM sleep phase. Yes, I do have to fluff the comforter, but it is easy to do. People that complain about having to fluff up feathers/down do not need to have this type of topper because it is simply a fact that if you apply pressure to feathers, they are going to compress. I took a king size sheet and covered my topper and it works like a cover......... no need to purchase an extra cover. I do not feel any quills sticking through and poking me. It did not have any odor; therefore, no need to air it out. And the true testament to my statements is my three cats, Robert, Russell, and Porsche think I purchased this topper for them. They are on my bed for all of their "cat naps" and sleep with me all night. I go to work and tell my friends that I am "sleeping like a baby". Very pleased with my purchase and would highly recommend this product to anyone who is having difficulty falling and staying asleep, waking up with painful joints, or whose mattress is too firm. Very happy with this purchase. Place on top of matteres and put fitted sheet on top. I haven’t had any problems with poking feathers as the top is down. I don’t get hot in the summer and is really comfy in cold weather. I would reccmend to a friend. This was our first featherbed and it exceeded our expectations. Here is the deal...it is absolutely 5” thick. It is not 5” thick after you spend the night sleeping on it, of course, but you should fluff it every couple nights, and when you do, it is 5” thick. 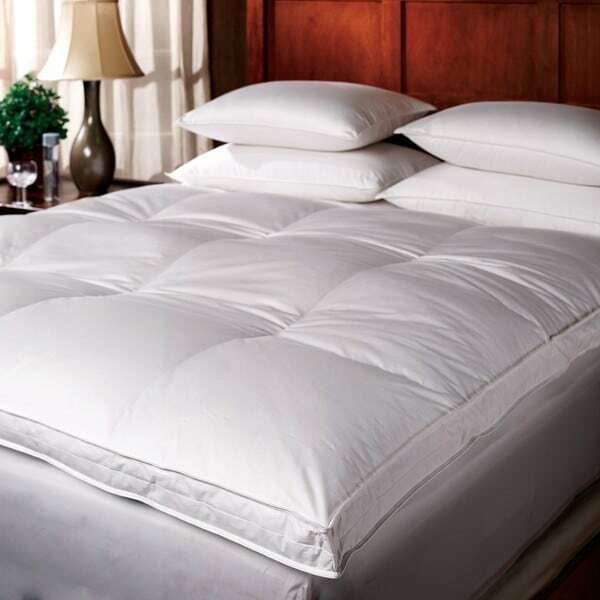 You will need to purchase a mattress cover that is made for very thick mattresses because you own this featherbed. It is warm and soft and it turned our aging, but high quality pillowtop into a night at the Ritz Carlton, I promise you. This is probably not an ideal purchase for someone who desires a firm mattress or someone who desires the lowest possible maintenance. If you want a soft, comfy bed, and a few minutes of work every second or third night is worth the trouble for the most amazing sleep of your life, look no further. I bought this to replace the five inch baffle box featherbed with cover I bought on O that was great when new but the stitching in between the baffles gave way and the bed was clumping and center baffles were empty. This one has the layer of down over the feathers and is more expensive. It’s not as thick as my previous featherbed but it’s more plush. It fluffs up very well, it stays fluffed longer than my old one. I’ve had it a few months and have put it in a big dryer to fluff it up when it arrived, but haven’t washed it yet. I am very happy with the bed so far. The extra layer of down on the top makes a difference. I purchased this topper and what a great deal it has turned out to be. I shopped around had just sent a terrible one back but this one seems to be just what the description said it would be. I have had 4 back surgeries and this topper has made all the difference in the world. I no longer have to sleep in a recliner.THANK YOU OVERSTOCK. I've recieved this package yestersay and tried to sleep on this last night. First of all, the down top featherbed is 95% feather, only 5% down.. I've read questions & answers in the bottom page that indicated the down feather bed is 80% down with 20% feather... it is completely not ture.. I think it's 3~4 inches when you're laying down... since the cost of the feather bed is more than $200, I think you can find an alternative down feathers with lesser price, with same quality. I am very happy with this Down Top Featherbed. My bed feels so comfy and you sleep like a baby! Most comfortable feather bed I’ve ever had! Very happy with this purchase! It definitely is one of the most thick feather beds I've encountered. Fluffing is par for the course with an item of this nature so I had no expectations here but it does also stay considerably dense days in. I did think the box stitching went all the way through to both sides and that's my only let down....(as that would keep the feathers designated better to a smaller coverage area). Love the product, it has help me sleep so much better, and i wake up with no back ache. Just wasn't the nicest cover i've seen, feathers flying everywhere, not soft, doesn't stay in place. I sent it back. This is sooooo comfortable !!! It makes my bed feel like a giant pillow I slept so well ! No need to get a whole new mattress this did the job ! It is heavy so fluffing it out takes a few minutes but definitely worth it ! I searched a long time before buying this featherbed... worth the money in my opinion and is very soft. I have back problems and my memory foam mattress was too hard. Problem solved with this featherbed. A perfect topper for our bed except I have to fluff it very morning. So nice! Feels like sleeping on a cloud! I bought a very expensive mattress that was SO firm. This allowed me to not have to spend $3k on a new mattress. I would seriously recommend this product. Product matches the description. warm, soft and lightweight. We used this featherbed on a pull out sofa when my family came to town for the holidays. The thickness of the down is perfect and provided great comfort! LOVE THIS PRODUCT! IT STAYS IN PLACE AND FEELS LIKE YOU ARE SLEEPING ON A CLOUD!!! I just love this featherbed. It’s one of the better ones I have bought over the years. So long as you fluff them up regularly, all is well in the feather bead world. What a difference this has made in my ability to get a good night's rest! I was ready to replace our 3 year old KIng pillowtop mattress, but my wife suggested we try a topper first. I looked at foam toppers, but reviews indicated they retain a lot of body heat and that is anathema for me. On the other hand, I remembered spending a few nights at a lovely inn that had a feather bed topper and decided to check these out. What I discovered is that the down in this topper is separated from the feathers by and internal piece of fabric. This is why I believe some people say the topper has a problem with feathers sticking them; they put it on the bed upside down! Our fitted sheets aren't large enough to fir over this topper AND the mattress, so we ended up using a mattress protector and the fitted sheet goes over the topper. This has a side benefit in that I can fluff the topper every morning by simply grabbing a side and shaking it several times. Works great and I am sleeping like a baby! The most comfortable feather bed I've had yet. I'd definitely recommend this to anyone looking for a softer sleeping experience. I'd buy this again. This mattress top doesn't stay in place at all and squishes to one side when I get into bed. Doesn't help at all. Plus the feathers were sticking up all over and poking me during the night. Won't purchase again. Love the feather bed. It's so wonderfully lofty; it's like sleeping on a cloud! "I looking for a feather bed topper to put on a sofa bed mattress. How would I best store it when not in use?" "After lying on it for so long does it go flat?" This feather bed is filled with a natural product (feathers and down) and just like a pillow it has to be fluffed. We would suggest fluffing your topper every time you change your sheets for optimal performance. "What do you love about this Down Top Feather Bed?" I love this Down Top Feather Bed because it gave me back my good nights of sleep. I thought I was developing arthritis in my hips and shoulders because I would wake up several times throughout the night with my shoulder and hip joints hurting. I purchased this feather bed and it alleviated my joint pain. It was not arthritis, but my mattress was putting excess pressure on my joints. I might add too, that I was getting up 2 or more times to go to the bathroom and after sleeping on the feather bed, that too ended as the mattress was also putting pressure on my bladder. I sleep so soundly now that I go into my REM Sleep Cycle and have started dreaming again. I would recommend this feather bed to anyone who is looking comfort and restful sleep. And............ yes, I do have to fluff it, but the sleep I now have is worth every shake! "How big is the full/Queen? I have a queen size bed & would hate to end up having it not fully fit across the mattress because it’s closer to a full size. " The exact dimensions are 64"x84". A typical Queen Mattress is 60x80 so this will be fit a queen mattress perfectly. I have several of these on queen beds in a rental house and they fit very nicely! "What is the exact fill material? It says feathers/down, is that goose feather and goose down?" Our Down Top Feather Beds have 80% White Duck Down top and Grey Duck Feathers as the bottom! Super comfy and you will love sleeping again! "What does the warranty cover?" Great question! Our 1 Year warranty states that we will replace the Down Top Feather Bed if it is defective due to faulty workmanship or materials. "How should u use an electric mattress pad with a feather bed"
You can use it the same as you would on a mattress. Put the feather bed on top of your mattress and the pad on top of the feather bed.